Modern rotating machines operate at higher shaft speeds, crossing a few bending critical speeds, which often induce large dynamic loads on the bearing supports that may increase the rotor orbital whirl motion. Accurate prediction of squeeze-film damper (SFD) forces is the key issue for designers to arrive at a suitable design. An experimental setup was developed with eccentric shaft to find the damper forces. Submerged type damper with relatively large clearance was considered for the present work. It results in higher gap Reynolds number (Re) which varies from 1.5 to 15 in the present case. Four force sensors are used to measure the damper forces and two eddy current probes were used to measure the damper orbit. Circular-centered orbit (CCO) of eccentricity ratio (ε) 0.176 was used in the present work. 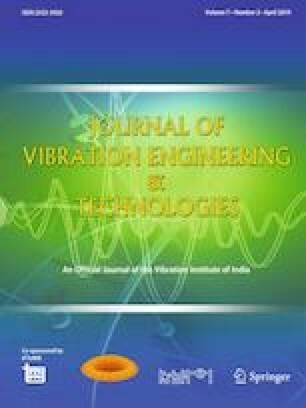 Theoretical modeling of SFD forces is considered with viscous, inertial, temporal contributions under laminar and turbulent conditions. Modified Reynolds equation with short damper approximation is used to derive the SFD forces for 2π- film. Fourier coefficients of measured forces and displacements are estimated and used to extract the 1× components and phase information. Radial and tangential forces were calculated from the measured total forces to find the contributions of viscous and inertial forces. Experimental forces are compared with theoretically predicted forces and they are in good agreement with the experimental results.